Smell that asphalt? That’s the smell of money for many Galaxy customers. Better yet, there’s more to come—analysts are predicting that U.S. paving asphalt demand with increase annually by 3.1% between now and 2019 as governments scramble to maintain our aging road system. By 2019, that will amount to almost 18 million metric tons of asphalt per year, according to Freedonia Market Research. What’s especially exciting is the variety of paving systems in the field. Contractors will be patching, reclaiming, laying new hot- and warm-mix pavement and using asphalt emulsions for in-place recycling. With that much diversity in paving technologies, it’s no surprise that Alliance Tire engineers have been working hard to provide a wide range of tires for paving equipment. The superstar of the Galaxy line for paving re-claimers and loader grades is the Galaxy Giant Hippo. It’s as tough as the beast it was named for, with an aggressive tread design and thick massive lugs for long-lasting performance. The Giant Hippo’s buttressed shoulder also transmits more engine power to the ground, which is good news for operators loading crushed pavement. The Giant Hippo is also popular on vibratory rollers, where we also sell a lot of diamond-tread Galaxy Compactor R-3s. For backhoes, the Galaxy Jumbo Hulk is the tire of choice. In many cases, the Jumbo Hulk will last longer than the backhoe it’s mounted on! In fact, I recently talked to a contractor who’s had a set of 19.5L-24 Jumbo Hulks on his Case 580 for eight years—more than 5,000 hours—and they are still only half-worn. Skid steers are workhorses in paving reclamation. They’re often going from newly broken rubble to smooth pavement and back again, all day long. That takes a real workhorse of a tire, which is why we see a lot of Galaxy Hulk and Galaxy Trac Star tires at roadwork sites. With tough compounds, durable rim guards and large lug-to-void ratios, those tires are built to take punishment. For skid steers that spend most of their time on hard or packed surfaces, the Galaxy King Kong is optimized for long service on smooth pavement. 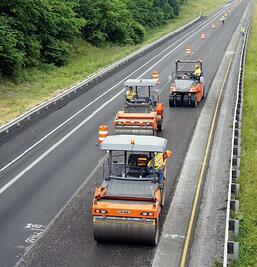 Paving contractors have a long road ahead…in the best possible way. No matter how you tackle reclamation, repair or new pavement, Alliance Tire and our Galaxy brand will be there every mile of the way!